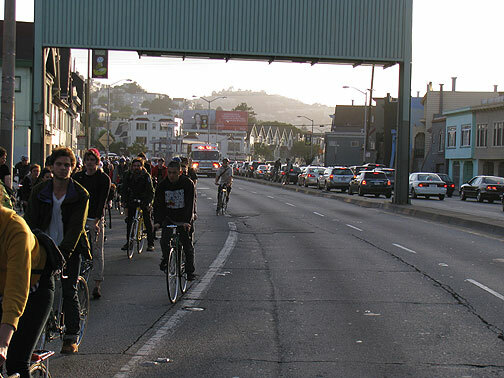 Uphill on Potrero crossing 16th Street, August 2010 Critical Mass in San Francisco. So I’ve been piling up all the photos from my various trips the past month. 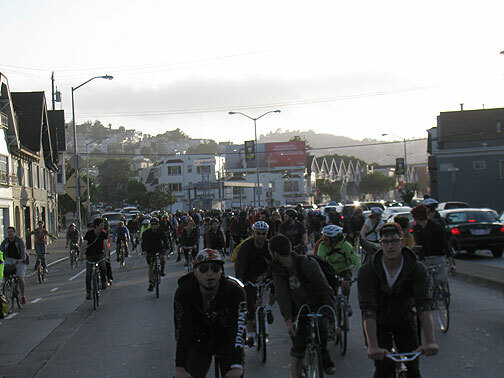 Before I go into a long sequence of photos in the next post, we had an incredible Critical Mass last Friday night. 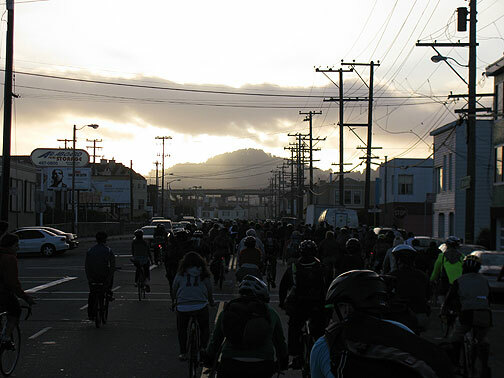 It was led on an unprecedented route–my congratulations to the folks who made the effort to get the ride out of its rut for a 2nd consecutive month (I rode in the back and had no idea who was out front doing such a good job!). 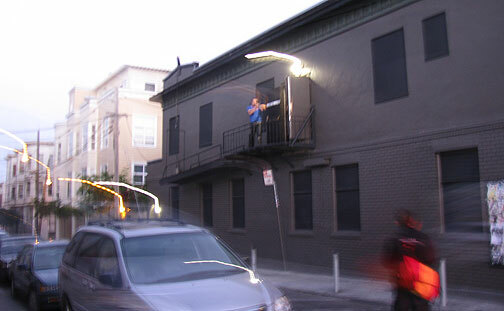 We went south, weaving through the South of Market to pop out on to Potrero and then much to everyone’s surprise, after a long cruise south past General Hospital we did a short jog right and left on 25th, Hampshire, 26th and Bryant to make a big left on Cesar Chavez. 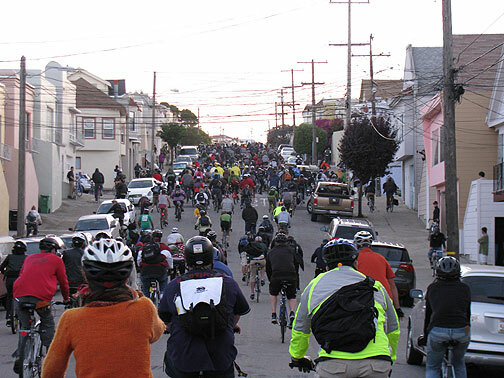 You get a sense of how huge our rides are from this shot, looking south on Potrero. 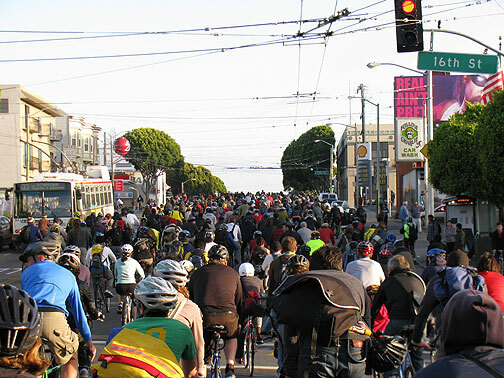 ...But after a siren indicates an approaching emergency vehicle, Critical Mass riders easily clear the road in seconds. We went south into the Bayview. 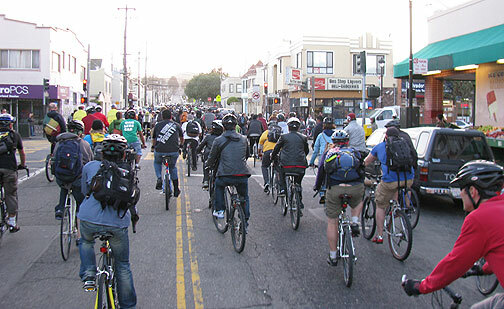 One of the occasional obnoxious comments hurled at Critical Mass over on our blog or in the always-insufferable SFGate comments is something along the lines of “why don’t you take your ride into the Bayview instead of going through North Beach, the Mission and/or the Haight every month?”Â Well we had a fantastic ride down there, first taking Bayshore Blvd and Oakdale, turning on Palou, south on 3rd Street for a while, and then a big westerly turn on Williams. A pause eastbound on Palou. 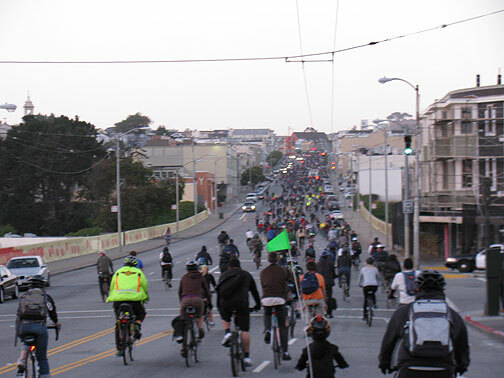 Westbound on Williams, well into the Bayview district. 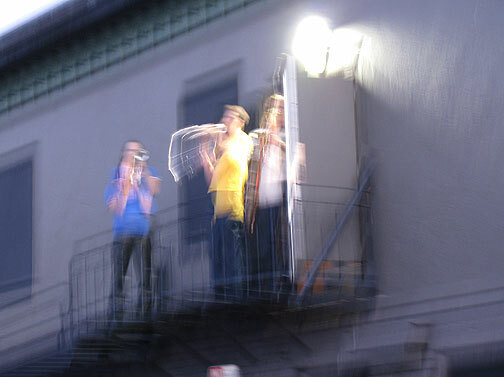 Happy neighbors marvel as we pass by. 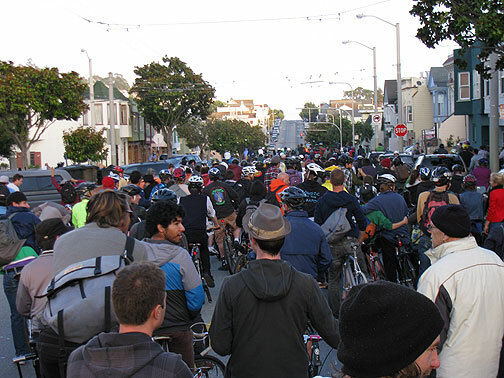 With all the online blather about how much people hate Critical Mass and bicyclists, if you rode along on most of our rides what you actually see are hundreds of bystanders smiling, waving, and cheering. 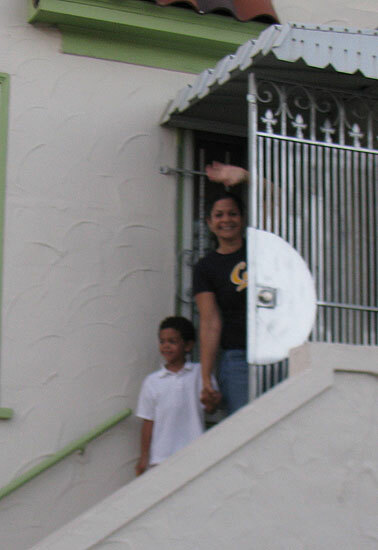 Whenever we go through residential neighborhoods we always get a ton of enthusiastic support from people hanging out of windows, clapping and cheering, and little kids get really excited. 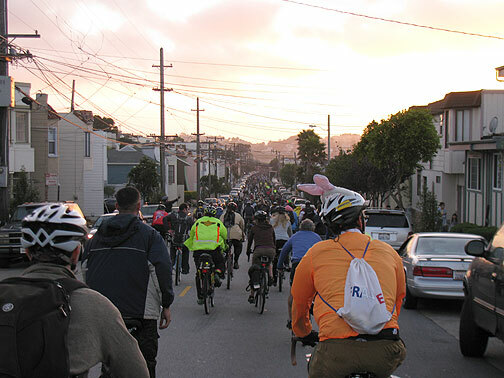 Imagine how it changes their imaginations to see thousands of cyclists streaming by laughing, talking, playing music, having a rolling party! 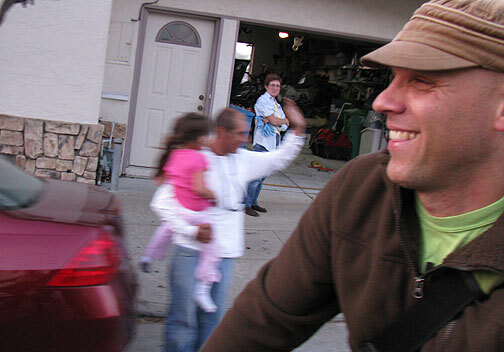 Justin just got back from a summer in Central America... the dad and daughter behind him were enjoying the ride as it rolled by. Don't think we've ever been in to the Portola neighborhood, long bisected by the 101 freeway, but here we crossed San Bruno Avenue at Bacon. After a couple of turns we ended up on Silver Avenue and rode past that weird massive Evangelical College (what’s that doing in San Francisco anyway?) and made the turn back to the center city on Mission. Heading north on Mission crossing I-280 not far from where there was once a trestle carrying a steam railroad across a creek. Check out the kid in the foreground! He rode all the way, as he did last month when we made it up to Twin Peaks! Definitely agree, one of the best in a long time.Â Huge thanks to whoever was in the front.Â Awesome route.Â Thanks! 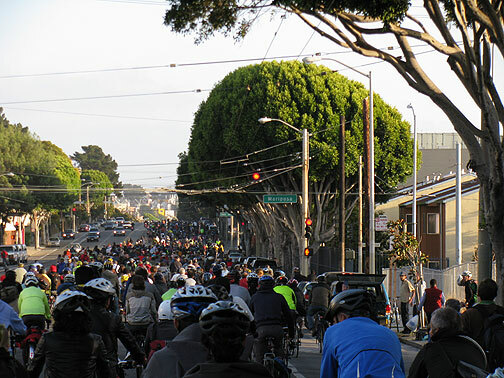 I happened to be walking across Potrero at 16th just before y’all silently thundered past; always an inspiration and confirmation.